Upper floor of a castle I built in builder's foam. 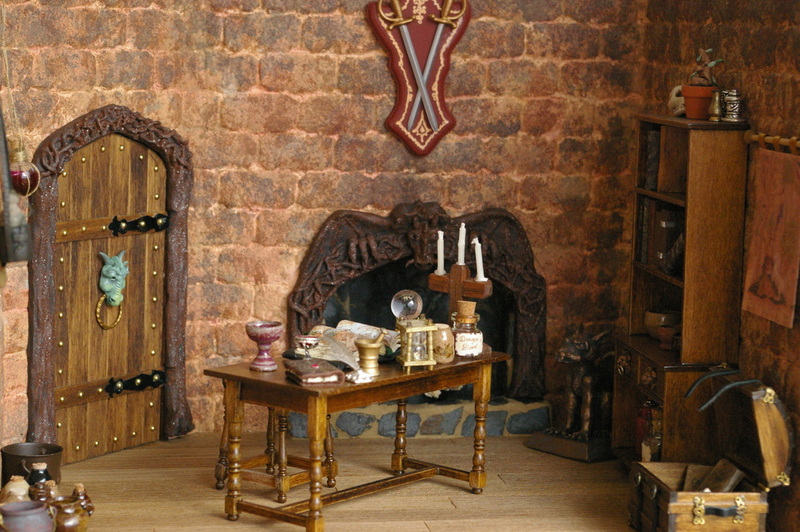 Most of the items are made by me, including the sculptured doorway and fireplace surround as well as the furniture and pottery. It is in 1/12" scale. 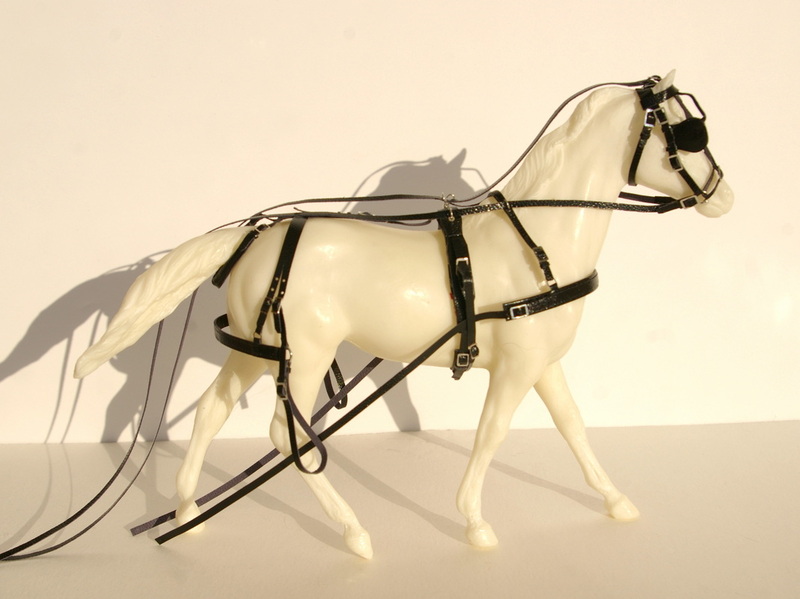 1:12 scale harness and bridle in black leather. All buckles are functional. Some of the straps are long and may need to be trimmed to fit your cart. 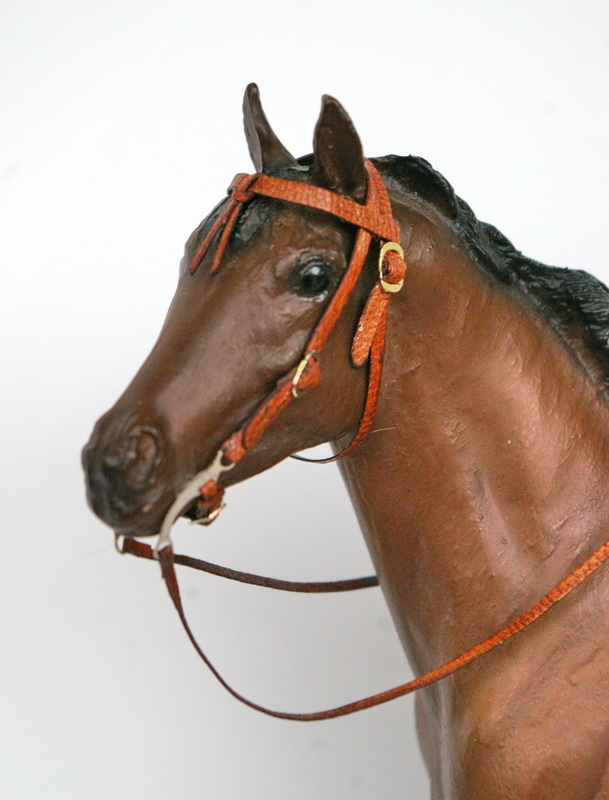 Bridle has no bit and is held on with sticky wax (not included). 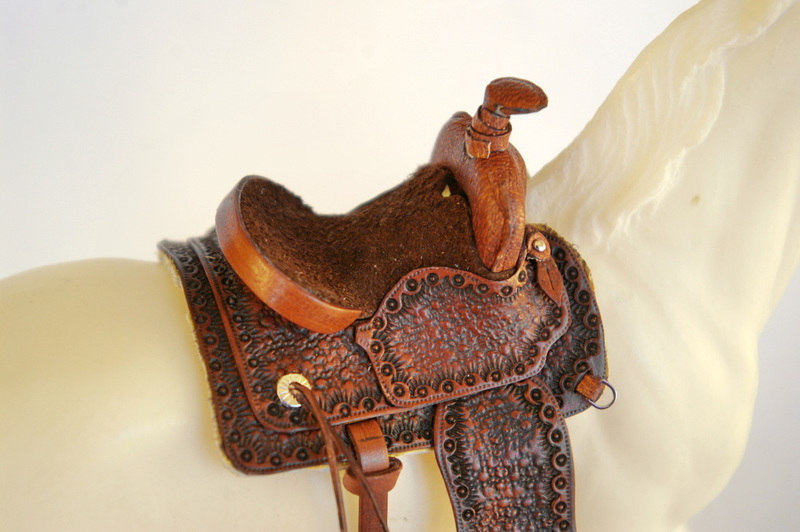 1/12" scale Western saddle in embossed brown leather. 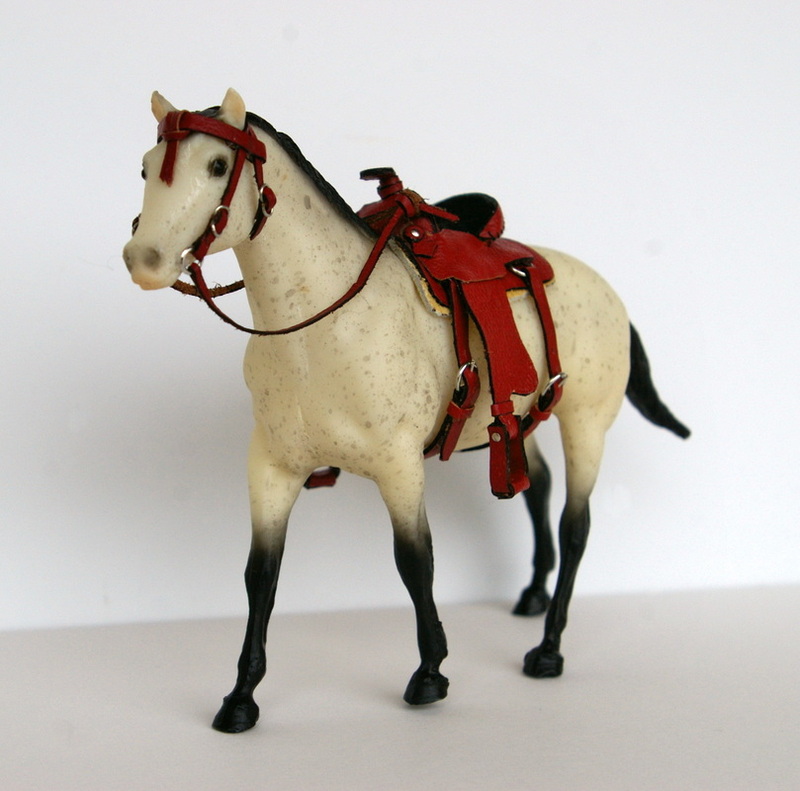 This fits a Breyer smaller Classic sized horse and all the buckles work. Bridle is dyed in the same colour and matches saddle. 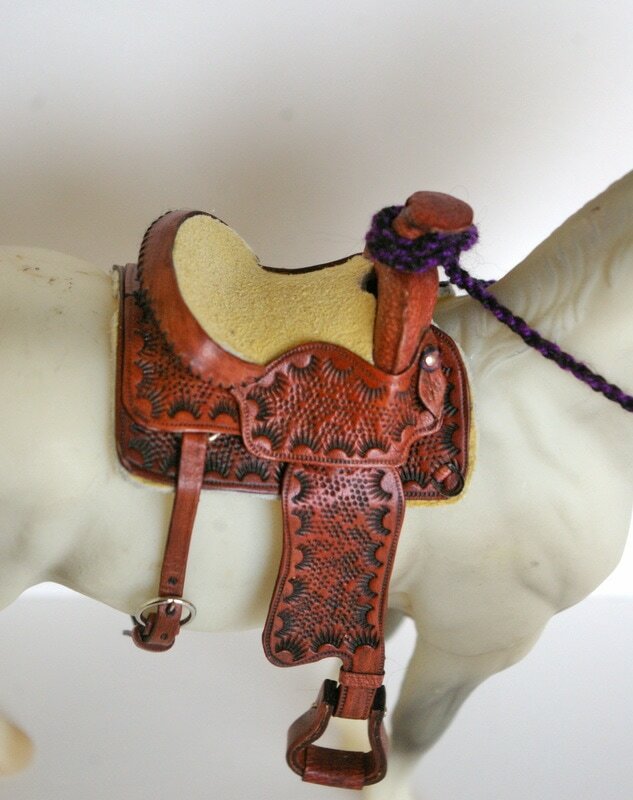 Reins are twisted purple rope with leather ends. 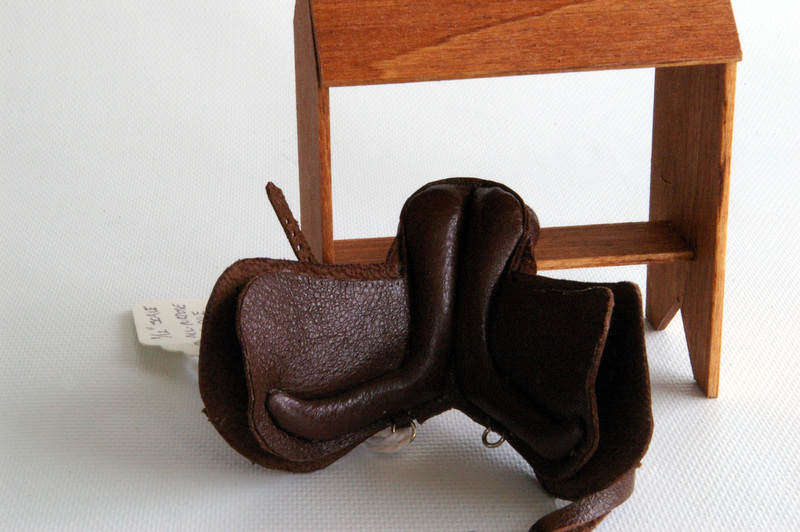 1/12" scale Western saddle in embossed brown leather. 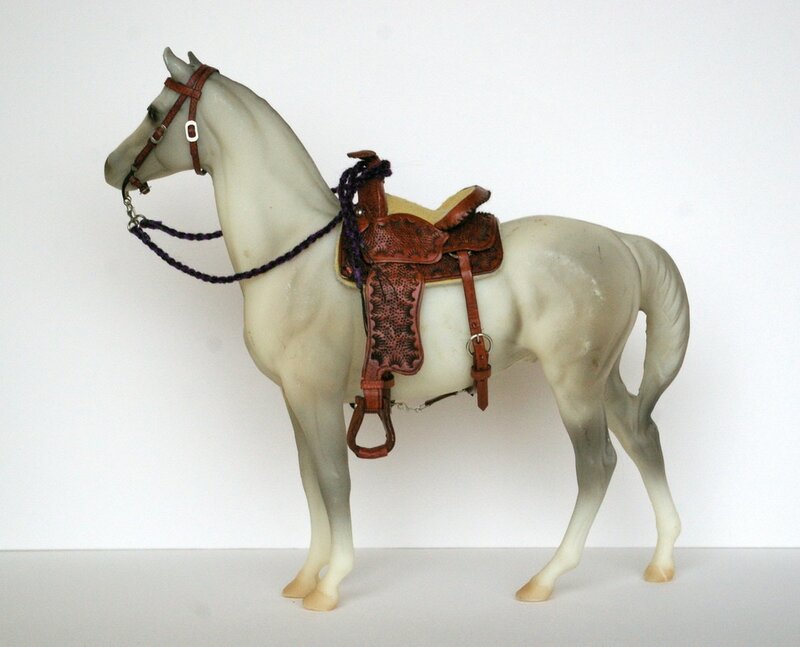 This fits a Breyer Classic sized horse and all the buckles work. Bridle is dyed in the same colour and matches saddle. 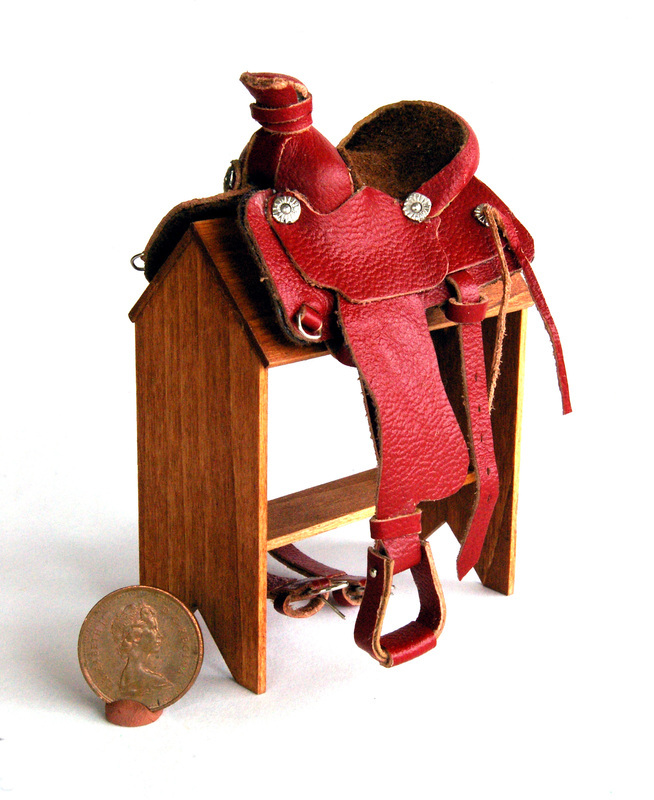 Red leather Western saddle and bridle in 1:24 scale. This saddle fits the Paddock Pals Breyer horse. 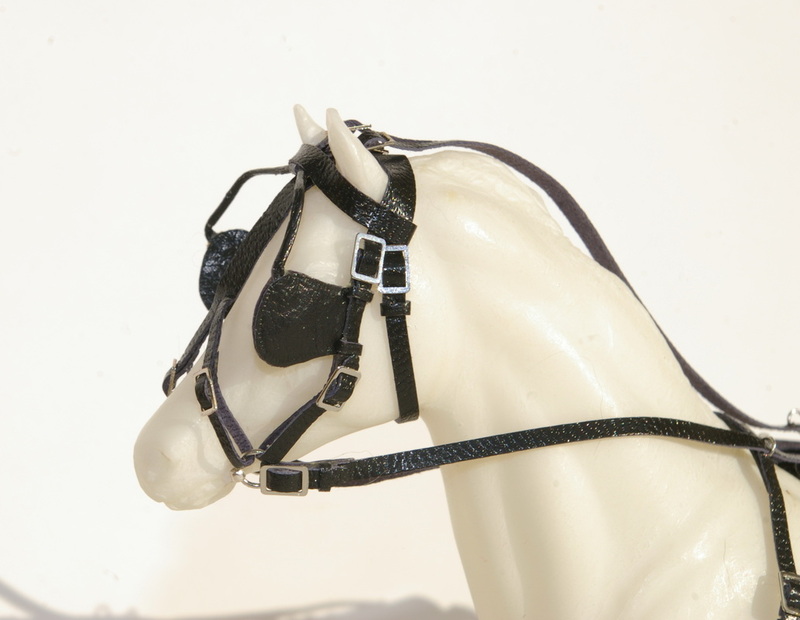 All the buckles function Bridle has no bit but is held on with sticky wax (not included). 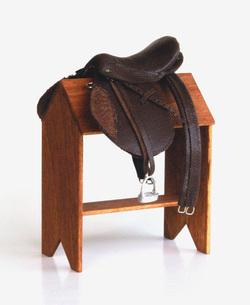 1/12" scale brown all-purpose English saddle and bridle. 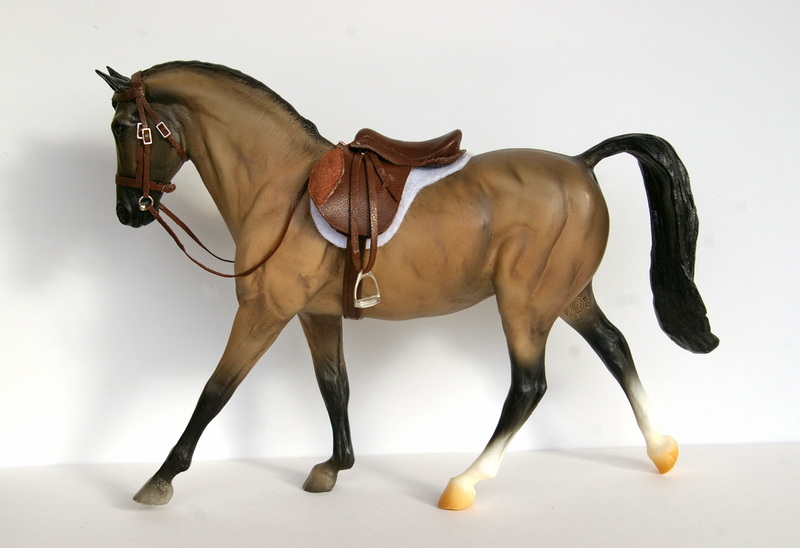 This fits a Classic sized Breyer horse. This is as close to a real saddle as I could get it. Bridle has no bit but is held on with sticky wax (not included). 1/12" scale Western saddle in embossed brown leather. 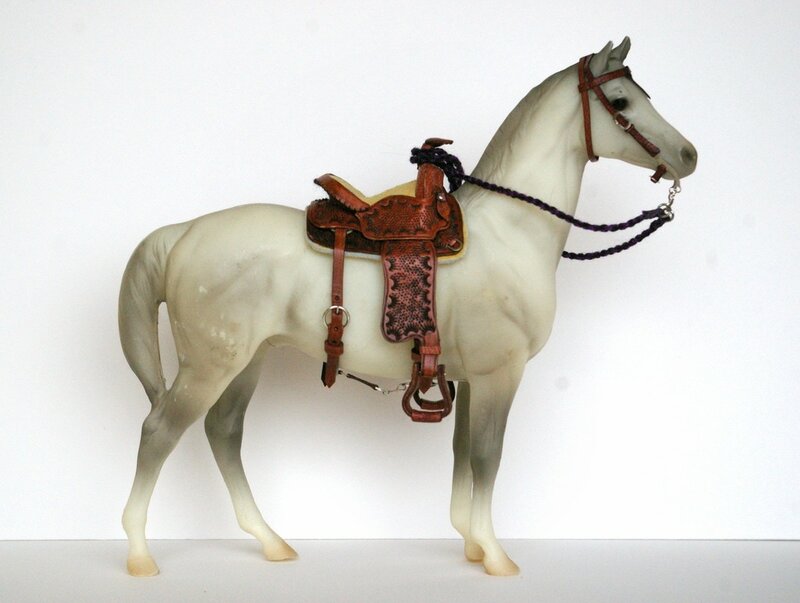 This fits a Breyer Classic sized horse and all the buckles work. The pattern matches the saddlebags below. 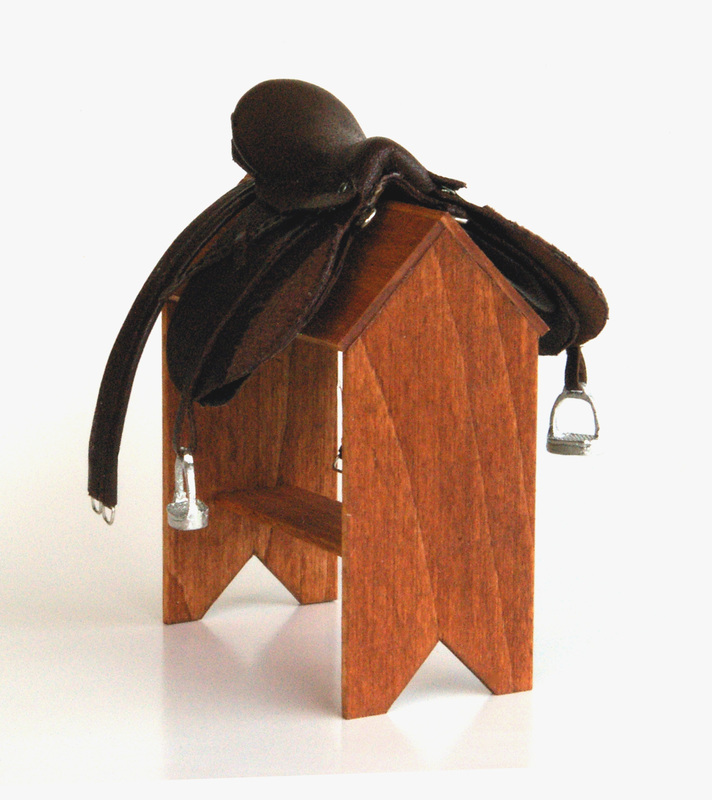 Bridle is dyed in the same colour and matches saddle and saddlebags. 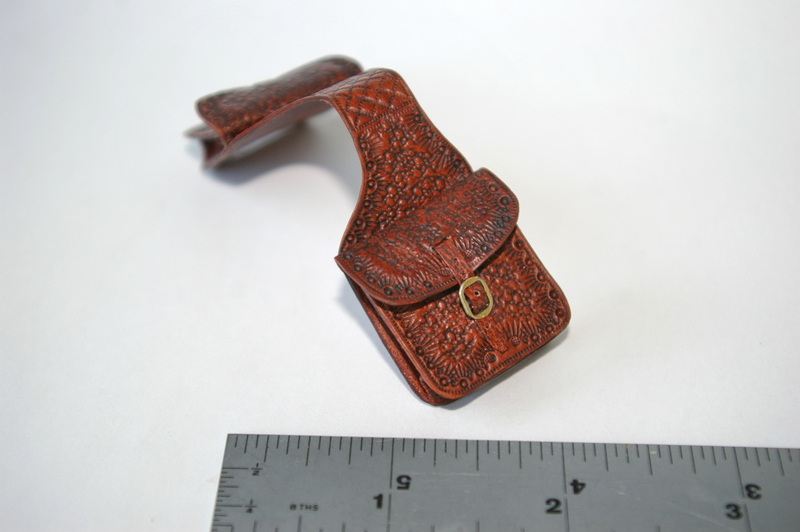 1/12" scale brown Western tooled/embossed saddlebags. These fit a Classic sized Breyer horse. 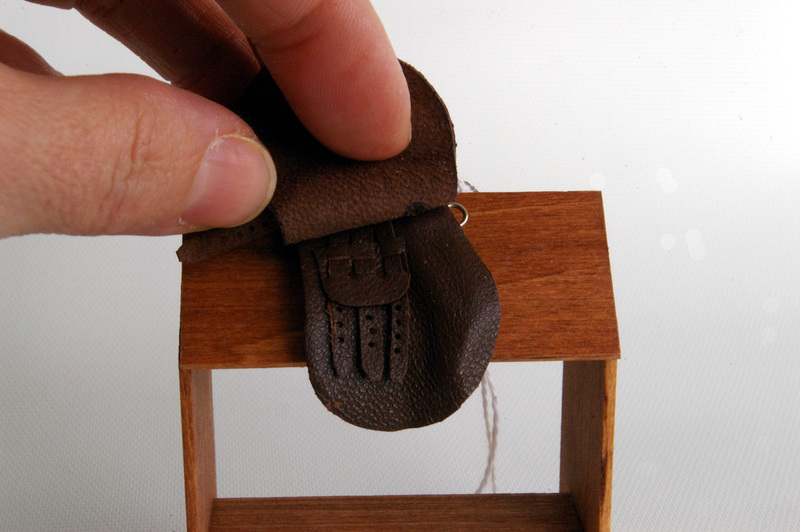 Buckles are fully functional and objects may be placed in the bags. 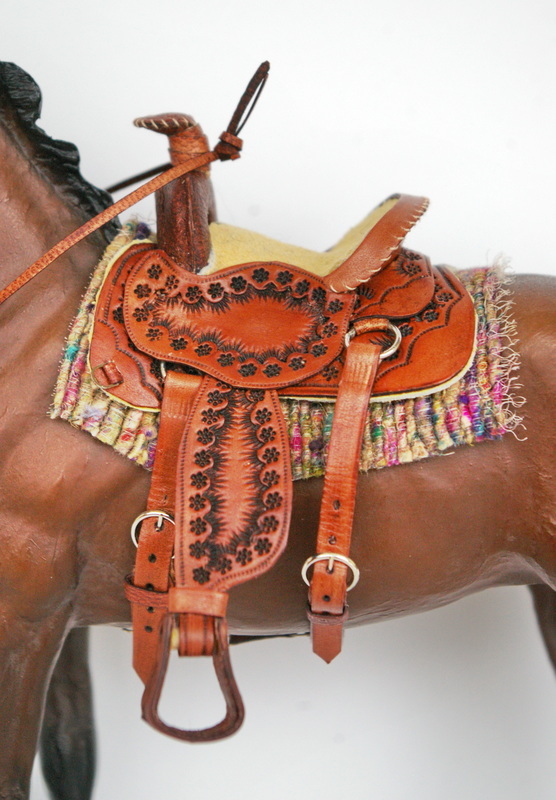 Pattern matches the Western Tooled Saddle above. 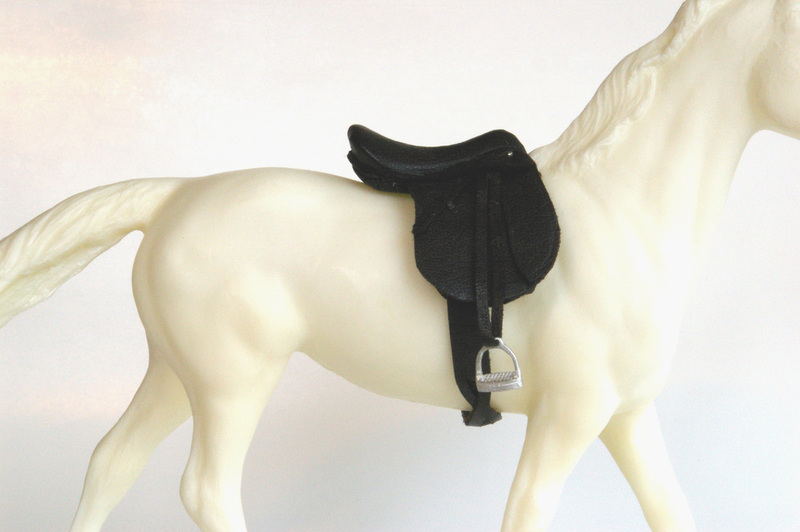 1/12" scale black all-purpose saddle. 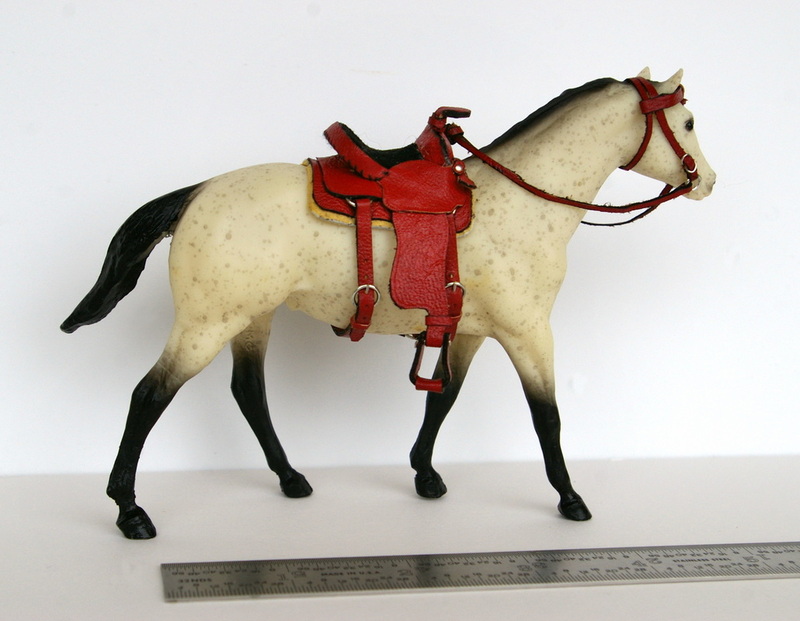 For you model horse collectors, this fits a Classic sized Breyer horse. This is as close to a real saddle as I could get it. 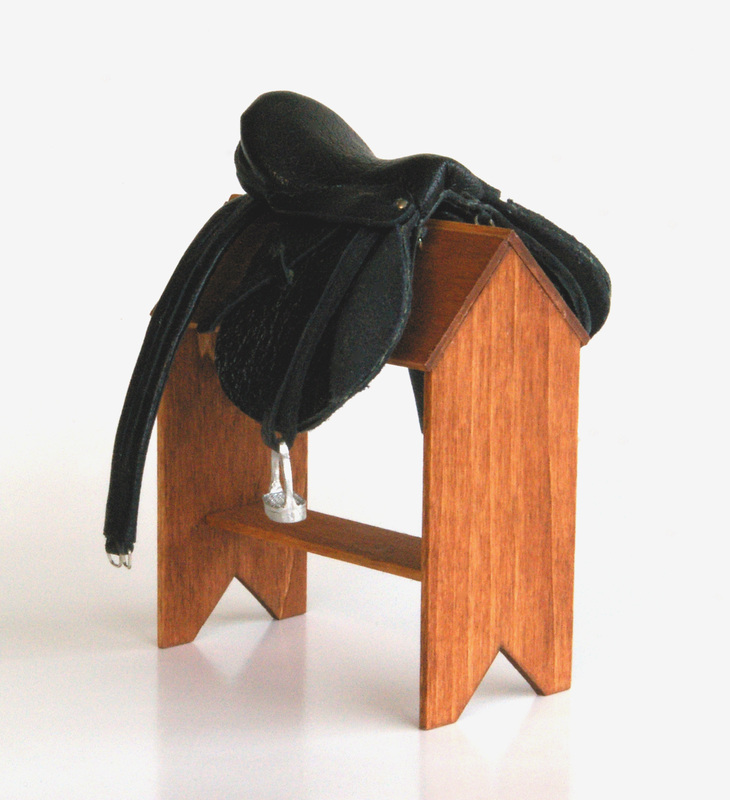 1/12" scale brown all-purpose saddle. This is just like the black one but in brown. 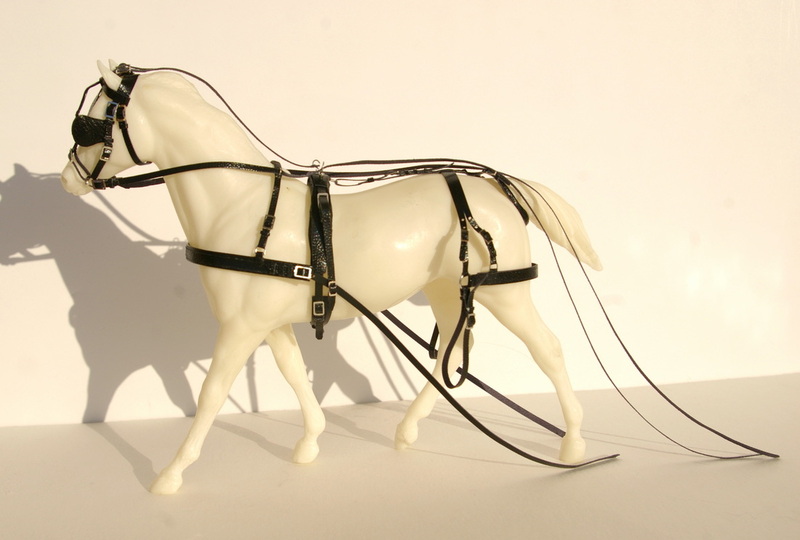 1/12" scale black Dressage saddle. Note: horse is not included, he's just my model. 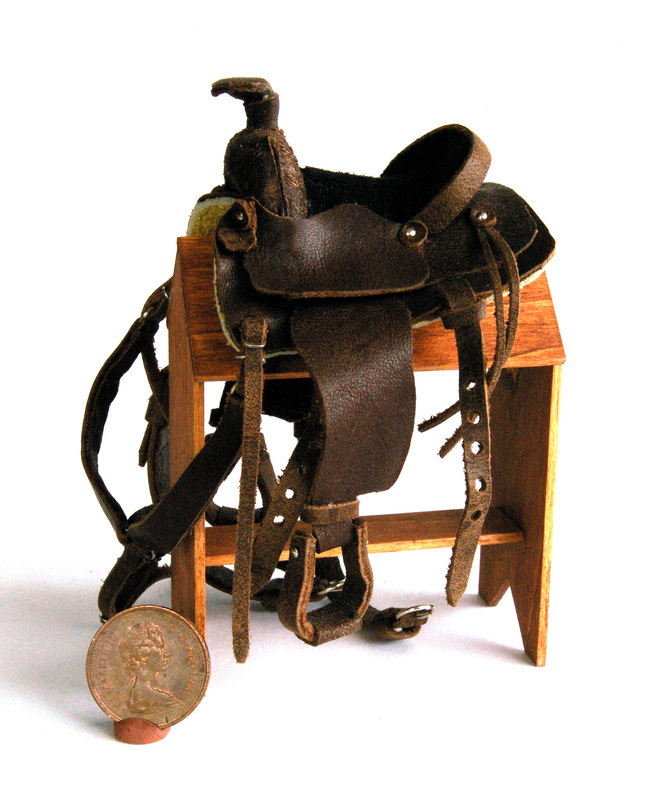 1/12" scale Western saddle in untooled brown leather. 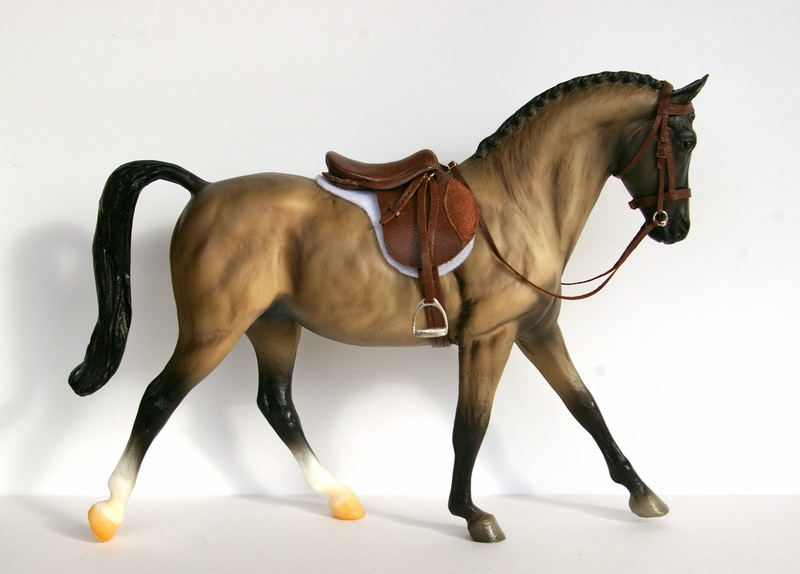 All elements function like a full-size saddle and fits on a Breyer Classic sized horse. 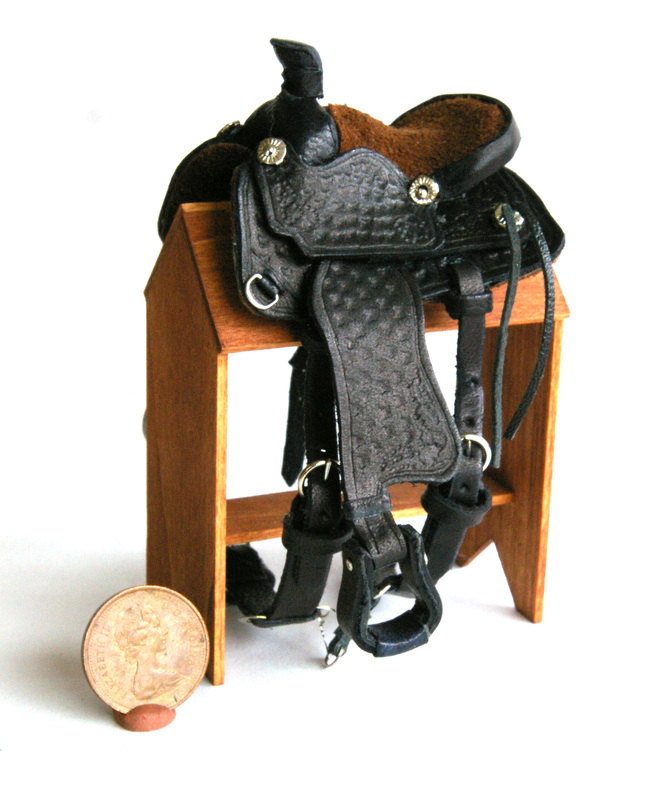 1/12" scale Western saddle in tooled black leather. 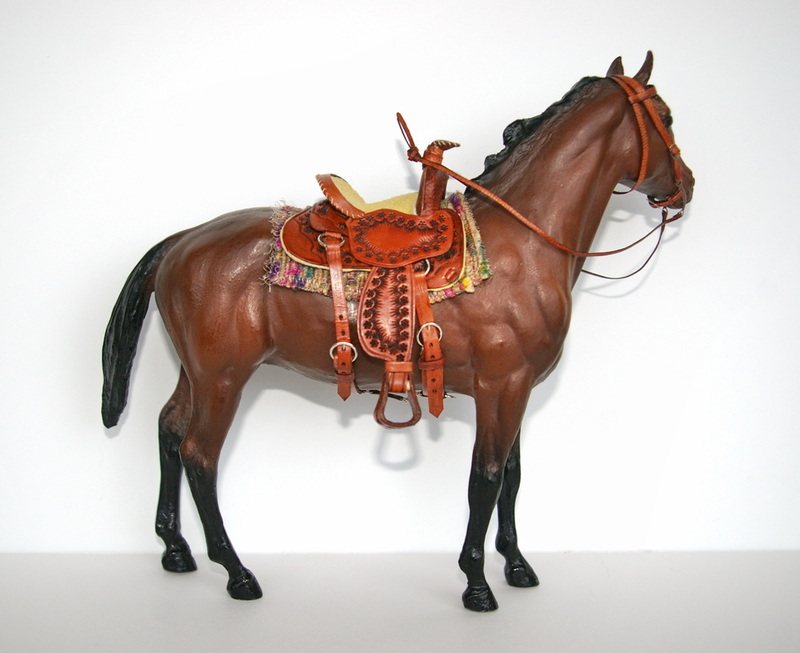 Again, this fits a Breyer Classic sized horse and all the buckles work. Now here's a funky saddle. Thought I'd try to see what the saddle would look like in red.